November 2014 - Bridal Hair & Makeup Artist | Shear Hotness, LLC. » Bridal Hair & Makeup Artist | Shear Hotness, LLC. 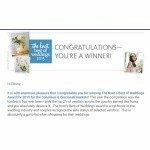 I am The Knot’s Best of Weddings 2015 Winner! !